By now you probably know that those tiny microbeads in your facewash do more than just clean your face – they have a sneaky way of entering our waterways and turning up inside the stomach of our seafood. While a few states have acted to end the use of microbeads in health and beauty products, little has been done on a national level, until now. The Microbead-Free Waters Act of 2014, which was introduced by New Jersey Rep. Frank Pallone, Jr. on Wednesday, would prohibit the sale or distribution of personal care products that contain synthetic microbeads nationwide by 2018. The small bits of plastic, often found in face washes, soaps and toothpaste, have become a hot topic for lawmakers and environmentalists in recent years. 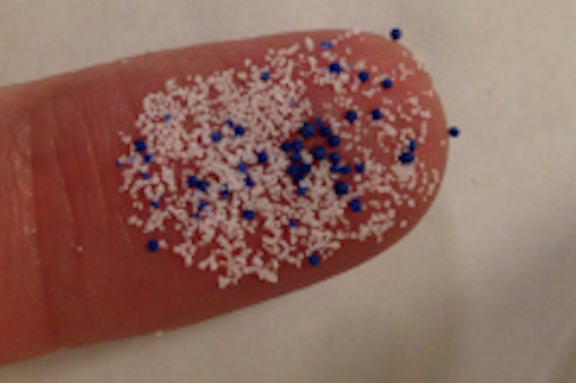 Earlier this month, Illinois became the first state to pass an ordinance that would gradually fade out the use of microbeads beginning in 2017 and ending in 2019. The Associated Press reports that the state bill, which was first introduced earlier this year, even had the cooperation of product manufacturers. An official with the Chemical Industry Council of Illinois says the quick deal resulted from unique circumstances, and the availability of substitute ingredients, such as oatmeal and sea salt. However, things don’t seem to be going as smoothly for similar bills in New York, California and Ohio. The New York bill, which was introduced in February, has passed the state’s Assembly, but is still waiting action in the senate, the AP reports. That bill is a bit more aggressive – banning the use of microbeads by 2016. Still, New York has often been in the forefront of the fight to ban microbeads for commonly used products. Officials with the state estimate that 19 tons of the tiny beads enter the states waterways each year. A report issued earlier this year by the New York Environmental Protection Bureau outlined just how unsafe the microbeads can be. According to the report, after microbeads are washed from our bathrooms, they easily travel through wastewater treatment plants and enter our waterways. The tiny beads then act as sponges for toxic chemical pollutants and become an attractive snack for marine wildlife. And because we humans often like to eat seafood, that means there’s a pretty good chance microbeads could end up in your stomach. Additionally, a 2012 survey of New York’s Great Lakes revealed that some of the highest concentrations of microplastics were prevalent in the water. Researchers used a mesh collector to gather 21 samples from the water. It was then determined that Lake Erie accounted for the vast majority of plastic collected with nearly 1 million particles present. The issue hasn’t just been on the minds of activists, either. Several major manufacturers, such as Proctor & Gamble, Unilever and Colgate-Palmolive, have pledged to phase out use of plastic microbeads. In February, L’Oréal said it would begin phasing out the materials this year in their Biotherm products and continue with Body Shop products in 2015. All of the company’s products are expected to be microbead-free by 2017. As for the bill to ban microbeads nationwide, its been referred to the House Committee on Energy and Commerce. GovTrack gives the measure a 4% chance of passing committee and just 1% change of being enacted.